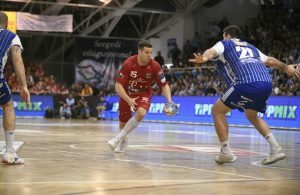 Two goals win in Lisbon gave a boost of selfconfidence to Telekom Veszprem players to play routinely in the second match against Portuguese champions – 35:29 (17:14). After bad form in the first part of the season, Hungarian vice-champions came one step ahead of the Final4 event in Cologne. Man of the Match was Manuel Strlek with seven goals. Veszprem waiting for better from the clash Flensburg Handewitt – Meshkov Brest. Next Story → VIDEO: HBC Nantes hero Romain Lagarde scores for TOP 8!